The Fisher Scientific Isotemp Drying Oven provides users with a stable and uniform chamber, digital control and broad range of temperatures. 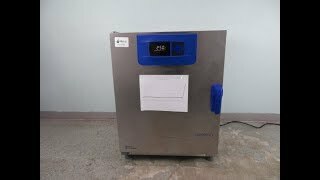 This lab oven is a great choice for applications involving drying, age testing, drying glassware, sterilization or even processing electronics, thanks to the force air circulation to whisk away moisture. The temperature range of this Isotemp drying oven can be set between 50° to 250°C from the microprocessor-controlled keypad, with crisp, easy to read display. This key pad also lets you program on and off times for automated operation. The interior chamber of this 3.65 cu ft volume general purpose heating oven is a corrosion resistant stainless steel with smooth coved corners for easy clean up and features a flexible shelving system that can be adapted quickly to optimize capacity. The sleek stainless exterior of this laboratory oven is corrosion resistant and is treated to be finger print resistant for a modern look. This compact lab oven can be set on lab bench to save space, has a manual air dampener to adjust the air exchange, and features a full swing out door, up to 180° for unobstructed entry. This Fisher Scientific Lab Oven CAT# 151030511 has been fully inspected and comes with a current temperature validation. All of our lab equipment comes backed with our standard warranty. Should you have any questions about this or any of our other laboratory ovens and incubators please don't hesitate to contact us.